I’m betting that one of the last things a parakeet parent wants to see is a line of ants trooping into their bird’s cage and stealing food! Ants are a common household pest and can be very difficult to eradicate. While I have never had ants go directly for my parakeets’ cages, I have fought many a war against them and I always come out the victor! 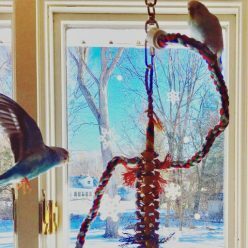 Here’s my recommendations for getting rid of ants in a way that is safe for your parakeets. First, as soon as the weather starts to warm up get a jug of TERRO Perimeter Ant Bait and follow the directions to surround the perimeter of your home. Of course if you don’t live in a single family detached home you may have to skip this step. I feel like it creates a first wave defense to deter the ants, although it will need to be reapplied periodically throughout the warm months, especially if you get a lot of rain. While you’re going around your house with the Terro, look for cracks and crevices that ants could crawl in and possibly access your home. These can be sealed with Caulk or Great Stuff . You can also take a peek at your trees for early carpenter ant activity. If the carpenter ant colonies outgrow their home trees they may come looking to take up residence inside your walls (eww), so if you see any your can lay out Terro traps at the base of the trees. I use both the Terro Outdoor Liquid Ant Baits as well as the TERRO Outdoor Liquid Ant Killer Bait Stakes . It won’t take out a whole colony but it does keep their numbers in check. We have also had several trees close to our house removed because the ants were out of control. I’ve used these traps mostly for carpenter ants, but they will work on any variety. Once you’ve laid all your outdoor traps and can focus on interior protection I recommend going around all your windows on the inside and caulking gaps here too. If you use caulk on the interior of your home make sure your parakeets are in a separate and well-ventilated area or outside of the house entirely. Caulk can have dangerous and deadly fumes. You can also keep stricter rules about cleaning and food storage during summer months. I’m never truly lax at any time of year, but during summer I make sure food is always put away and that food garbage from snacks etc. is always cleaned up promptly. A cup with juice residue left out by a human being could be a juice bar for a conga line of ants in short order! This also applies to parakeet feedings of fruits and vegetables. My parakeets do a fair amount of food flinging. It is a key part of the daily routine to check walls and floors for food scraps or smears. It’s also important to keep the floor clean with daily vacuuming or sweeping for dry spills and wiping down for wet. Even with all these precautions it is quite likely that ants are going to pass through your house at some point, and it doesn’t mean that you have done anything wrong or are “dirty”. Once you’ve got ants you will want to try and follow them to find out where they are coming in and out of your house and see if you’ve got an obvious breach. It’s tempting to seal that up right away if you find it, but don’t! First, whether you find the access point or not, get some TERRO Liquid Ant Baits and lay them in the ants’ path. Things are going to get gross after that, as the word gets out to the colony that there’s this awesome sugar well free for the taking. It’s tempting to want to kill all the ants you see at the trap but don’t. It is imperative that you leave the trap and the ants alone while they are actively feeding and taking poison back to the colony. After a few days the activity will drop off and once you are no longer seeing ants at the trap you can go ahead and seal up any access point you had found. Otherwise just remove the traps at that point; you don’t want to draw in a totally different group of ants if they are just wandering around. The TERRO Liquid Ant Baits have no discernable odor and are safe for use in the home but your parakeets should not be in contact with them. So, no putting any variety of Terro trap in their cages and if they are floor wanderers be VERY careful about that too. You could try taking them to another room for a few days when they are out or block off the traps to budgie access by hiding them under a heavy book. If you prefer not to use a poison at all you can get Food Grade Diatomaceous Earth (DE) instead. DE is a natural powdery substance made up of phytoplankton. It is completely non-toxic and even edible for mammals, but when an insect with an exoskeleton comes into contact with the DE it’s lights out! The DE pierces the exoskeleton and the insect dries up and dies. One summer I was at my with end with a colony of carpenter ants trying to move into my house, it turned out they were coming in under my baseboard heat radiators. I didn’t feel comfortable having the traps near the radiators, even thought they weren’t on at the time, so I bought a bag of DE and a powder dispenser to lay it down under the radiator. Then once the ants were dead I was able to easily vacuum up the DE powder and the ant carcasses. 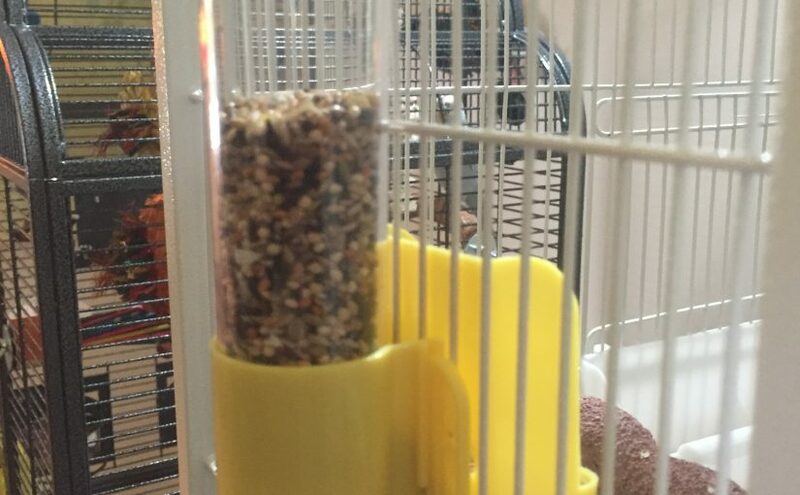 You can lay down a ring of DE around the base of your parakeet cage if you have ants that are climbing up to steal your parakeet’s food. This would be much safer than having poison close to their cages and even if they land in the powder it should not cause them any harm. I have even heard of budgie owners treating their parakeet for mites or lice with DE and applying it directly to the bird. 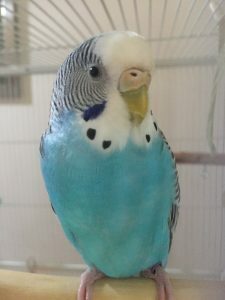 (DISCLAIMER: I am not a vet and I am not providing treatment recommendations for your budgie. 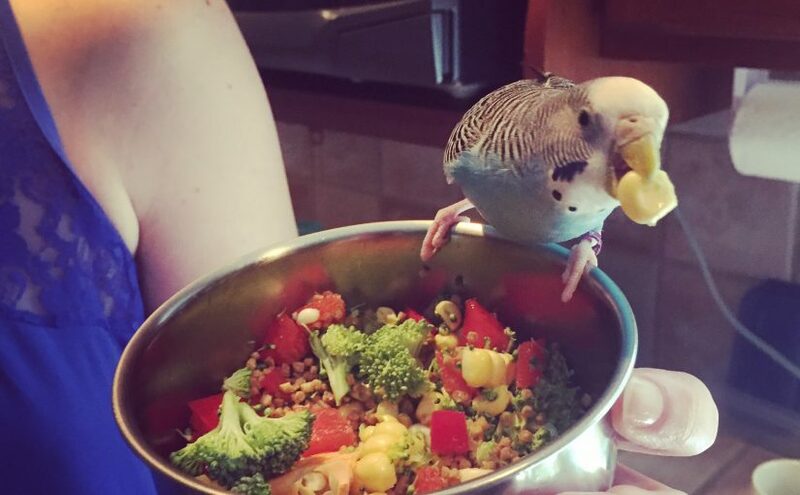 Please seek the advice of a professional vet if you have any questions about medical treatment for your parakeet. 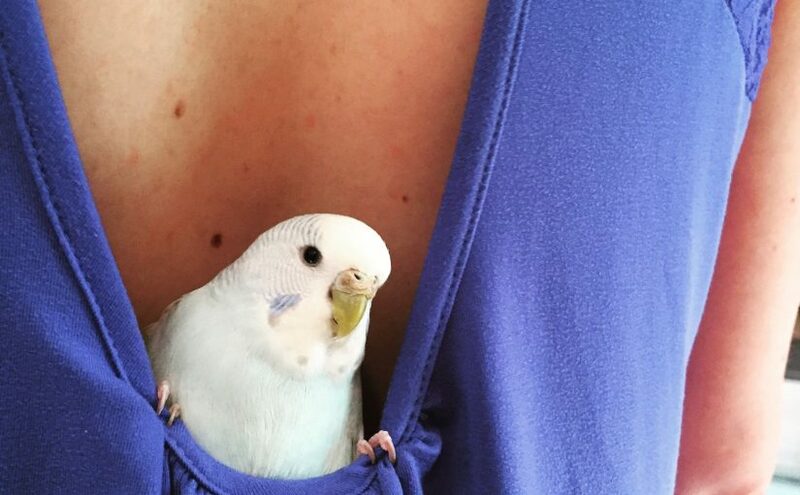 Home Keet Home accepts no liability for anything with which you treat your parakeet). There are loads of other natural remedies that insist ants won’t cross a line of cinnamon, or mint, or you can drown them in dish soap. I’ve tried them all over the years and for my part prefer the efficiency of the TERRO Liquid Ant Baits and/or DE . I hate to say that I have murder in my heart, but when it comes to ants I am guilty as charged, particularly if it means ants bothering my parakeets! Clipping a parakeet’s nails – mission success! After our first total fail at parakeet nail clipping I sought help from my favorite Facebook Parakeet Group. 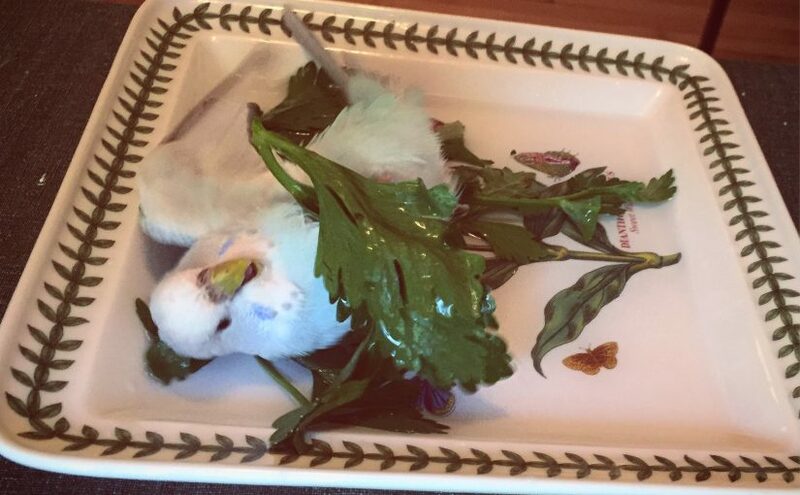 It’s not usually my first instinct to crowd source ideas on social media but I was feeling so stumped and dejected by the abject failure that I really needed some other humans to help before I tried clipping a parakeet’s nails again. I got tons of advise that ranged from taking the parakeets to a vet so we wouldn’t break their trust with us, to don’t take them to a vet for a nail clipping because they will probably have a heart attack and die! So, we could safely assume that the answers lay somewhere in between those two extremes. One thing that most folks agreed on is that trying to use the previously purchased Small Animal Nail Scissors was a terrible idea, and that it would be much easier to use regular small Fingernail Nail Clippers meant for humans. Another tip that I thought we should try was covering their faces while they were toweled to keep them calmer and reduce our risk of being bitten. I also knew that we needed to separate the parakeets for the nail clipping and take the “patient” to another room where they wouldn’t distract each other. This meant that the other human would need to stay in the “waiting room” with the parakeet on deck to keep them quiet. We were thinking that a ton of flock calling would be just as bad as being in the same room. We split up and Patrick took Toby to our bedroom and shut the door. I initially heard some flapping and evasion tactics but Patrick managed to secure her and make sure the towel (truly a cloth napkin) covered her face. From the other side of the door I heard the occasional snip of the nail clippers and some irritated squawking. After what felt like an eternity Patrick emerged triumphant! He managed to clip every single one of her nails, even though she was a squirmy worm, her head being covered meant she did eventually grow calmer, and using the human nail clippers was 100 times easier. Next up was Kelly, she and Patrick came back out so quickly that I felt sure he had given up but again it was a rousing success! Apparently with her head covered she gave up pretty quickly and stayed quite calm. I should add that Patrick also feed them some Spray Millet under the towel after every couple of nails to keep the experience somewhat positive. Both Toby and Kelly were pretty mad immediately after the clipping, but Kelly forgot the whole ordeal after just a couple of minutes (except when she couldn’t dig her claws into our couch to pull herself up anymore!). Toby, on the other hand, has decided to hold a grudge, but weirdly not against Patrick. She’s mad at me, which I really can’t figure out since I had nothing to do with it. I have known her to stay mad for several days, but I’m determined to win her back over! 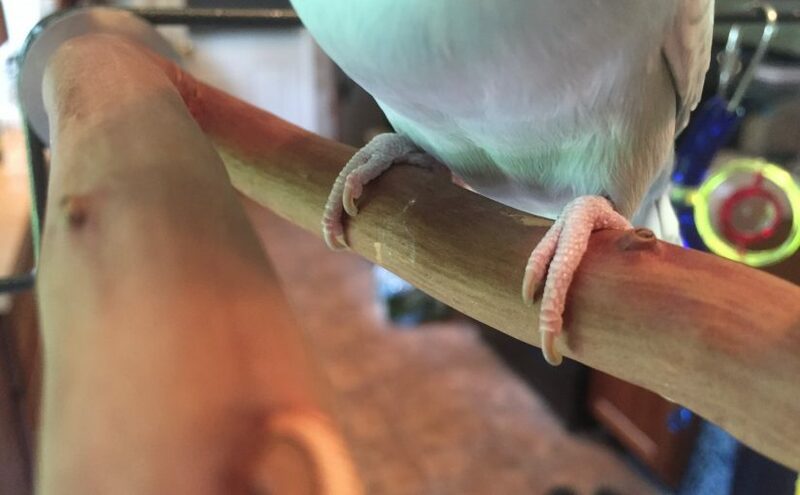 Posted on August 18, 2017 August 18, 2017 Categories UncategorizedTags basics, beginner mistakes, clipping parakeet nails, health, necessities, parakeet health, parakeet nails1 Comment on Clipping a parakeet’s nails – mission success!